For long-duration missions there is more than one CAPCOM, each assigned to a different shift team. After control of U.S. spaceflights moved to the Johnson Space Center in the early 1960s, each CAPCOM used the radio call-sign Houston. 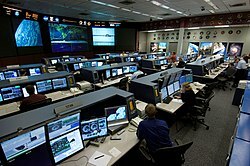 When non-astronauts are communicating directly with the spacecraft, CAPCOM acts as the communications controller.